I have driven by the signpost for Richtis Gorge so many times, going between Sitia and Heraklio for work, but I never had the chance to stop and explore. A week or so back I was in the area with some friends, and we decided to do a short hike. There are 2 versions. You can stop at the top of the gorge, on the national 'highway' between Sitia and Agios Nikolaos. 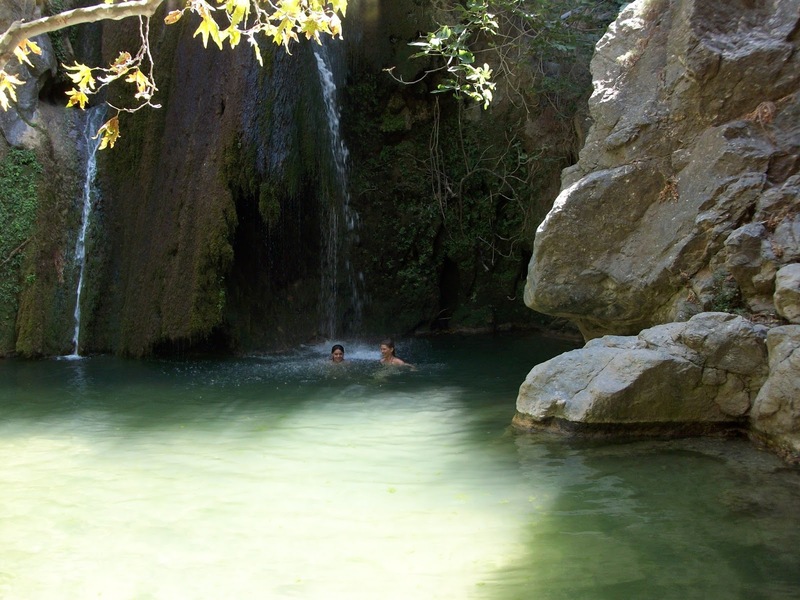 The entrance to the gorge is just after the village of Exo Mouliana, coming from Sitia, and just after Mesa Mouliana coming from Agios Nikolaos. Some friends of mine have done the full hike from the top of the gorge, and they said it took a bit more than 2 hours (they walk pretty fast). We took the easier version... we drove down to the beach at the end of the gorge. 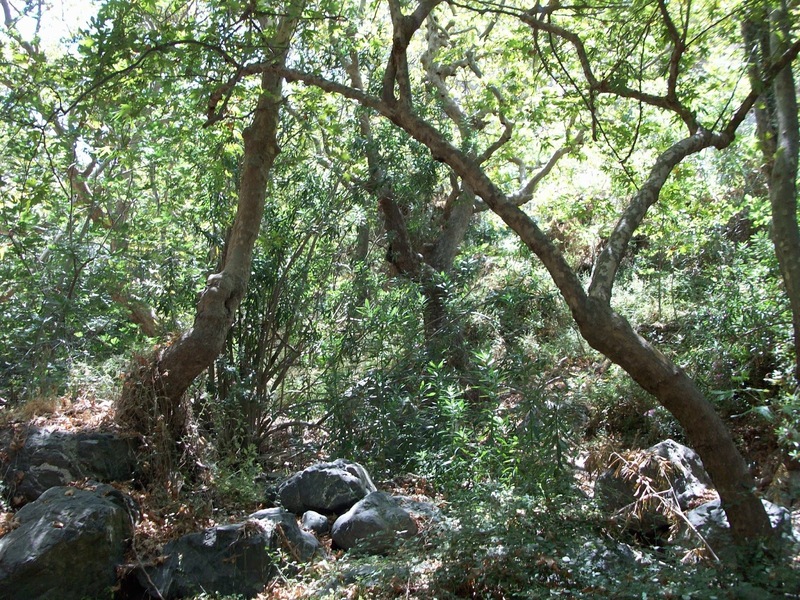 The turning is in the middle of the village of Mesa Mouliana, sign-posted 'Richtis Beach'). The road down to the coast is a bit hair-raising. It's mostly dirt road, with some fairly sharp bends. Luckily, I wasn't driving, and my friend seemed pretty confident about it. I just focussed on the view - the arid but extremely beautiful landscape so characteristic of the Lasithi region. The beach at the end of the gorge is small and rocky, and on a windy day the waves make it difficult to swim there. We didn't even try, we just headed straight into the gorge. For the first five minutes there is little shade. The gorge is at its widest here, and there are few trees. It is ideal, however, for picking wild oregano and sage. After a few minutes the gorge narrows, and the scenery changes dramatically. 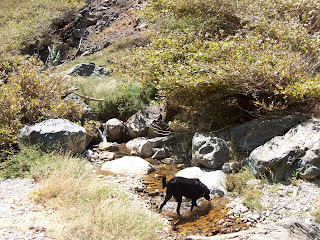 We were suddenly in some kind of oasis, with a small stream that still had plenty of fresh water for our dogs to drink and play in, and trees overhead for shade. It is really green and lush, even in August. This woody gorge is such a well-kept secret, hardly anybody I know has been through there. And you don't expect it. 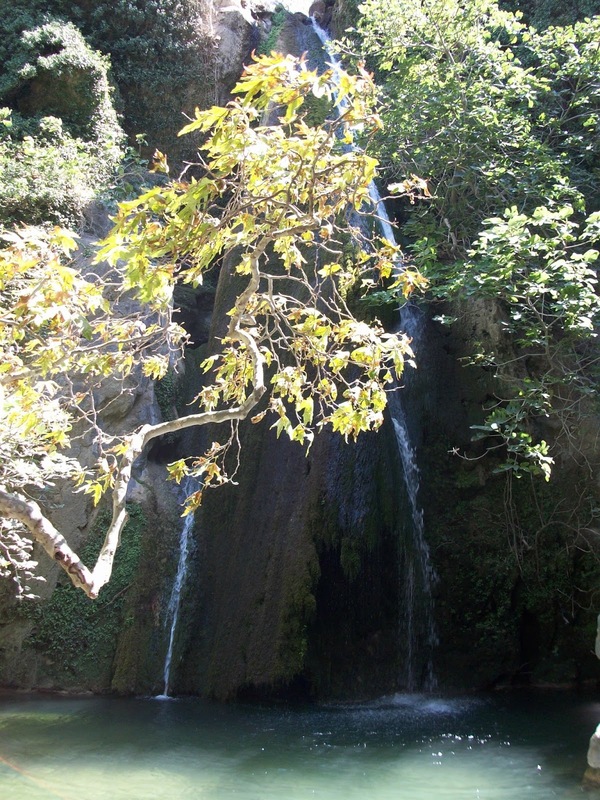 While driving through the wild and barren landscapes of East Crete, you don't really imagine there is a long, narrow stretch of woodland and running water. 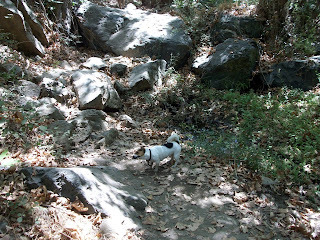 We followed the path up through the gorge for about 40 minutes, stopping to take photos, help small dogs over large boulders, rescuing big dogs from pools that were deeper than expected... Our dogs had a great time. 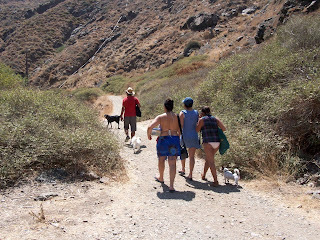 They were all excited, running through the water, climbing rocks, getting covered in mud. It made a great change from hiding in small patches of shade on beaches, for all of us. 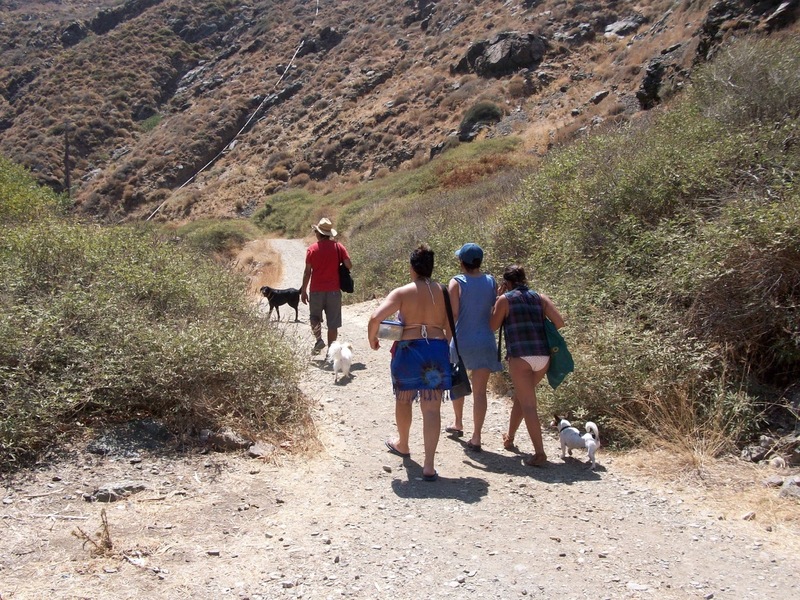 We were walking right in the middle of the day, in August, and it was easy going. The best part though, is that going this way through the gorge, after 30 or 40 minutes you reach the waterfalls. We stopped for quite a while to enjoy the waterfalls. There is a picnic table there, and space to sit around the small, deep pool where the water collects. Some of us were brave enough to swim under the falls, which was amazing. In summer the volume of the falls is just right to swim under; I imagine in the spring the flow might be a bit strong. I have heard that the gorge is not usually passable in winter, due to rainfall swelling the river. 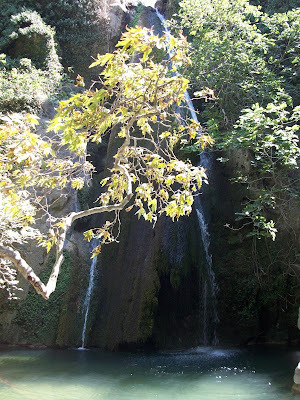 The pool was mostly shallow, but gets deep enough to swim close to the falls. It is also very refreshing (should I just say cold? ), especially after a midday hike. 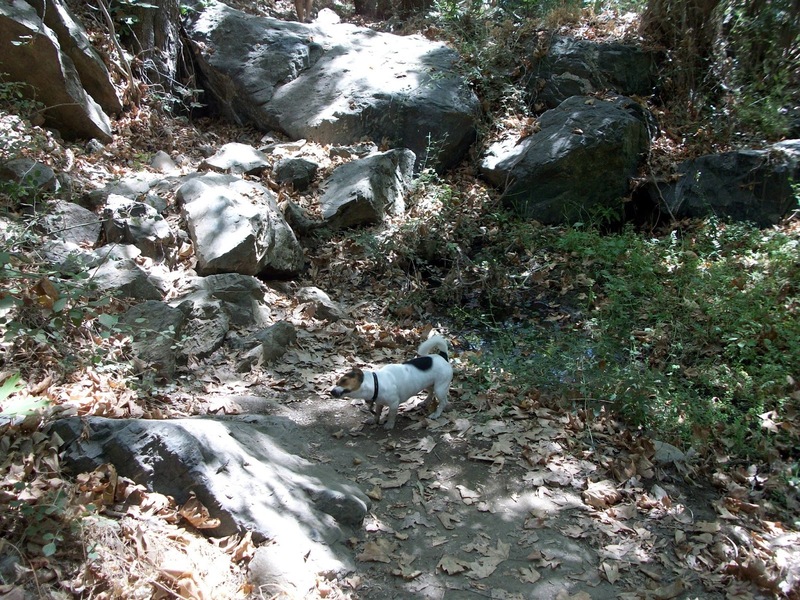 Our smallest dog, Princess, had an involuntary swim, and was shivering for quite a while afterwards. She cheered up on the way back down through the gorge though. We headed back down the gorge to where we'd left the cars after reaching the waterfalls, so I didn't get to see what the first part of the gorge is like. I'd definitely like to go back and walk the whole thing. The only problem is that unless you can arrange a lift to take you back up via the road, you have to walk back up the same way, which makes this quite a long hike. I would say the path was moderately easy, with a bit of scrambling, but not too much (we managed wearing flip flops and broken sandals). 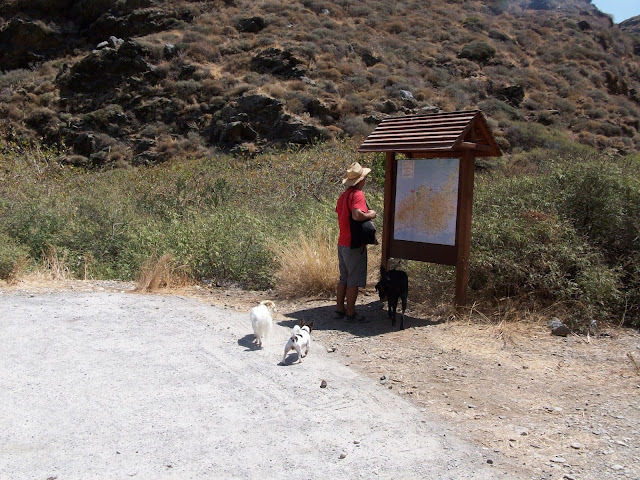 This is a great way to spend half a day, to see a different and unexpected side of East Crete. And, because it is not very well known there was almost nobody there, so we could let our 3 dogs off their leads to run around freely and enjoy themselves. We went on a quite day last summer. We walked from the top and it was amazing! We hitch hiked back to the national road with no problems. Well worth the time!